This was a short and quick hike. I had a meeting I had to be on time for at 5:30 PM, and it was a 15 minute drive from the mountain. So essentially I had to be down the mountain at 5:15. The problem was I drove the scenic route from Tucson and arrived in much later then scheduled. I had arrived at about 4:20 and told myself whichever point I am at on the mountain at 5:00, I would have to turn around. I huffed and puffed and made it about 90% up the mountain. So close yet so far. The weather was awesome - about 75 degrees. Not bad for mid-February! Parked on one of the parking areas at the entrance, and found the main trail and hiked it up towards the top, then took the same route down. I am not even sure of the name of the trail. The mountain was officially changed from Sqauw Peak to Piestewa Peak because supposedly Squaw is derogatory term to the Native Americans. 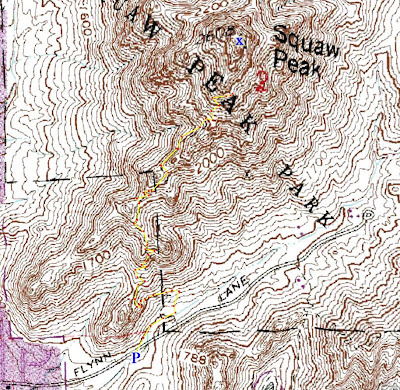 Everyone still calls it Squaw Peak. You can't change the name of a mountain - it just doesn't work. Continuing the ascent. Facing south. View of downtown Phoenix in distance. Looking west. Note the young Saguaros. View from right below the summit. This was as high as I got. Cliff with urban sprawl behind it.